B.S. in Journalism, 1941. M.A. in Political Science, 1946. Jim Armsey helped change the face of higher education in America. During his time at the Ford Foundation, Armsey shepherded hundreds of millions of dollars to universities and played a part in encouraging desegregation. 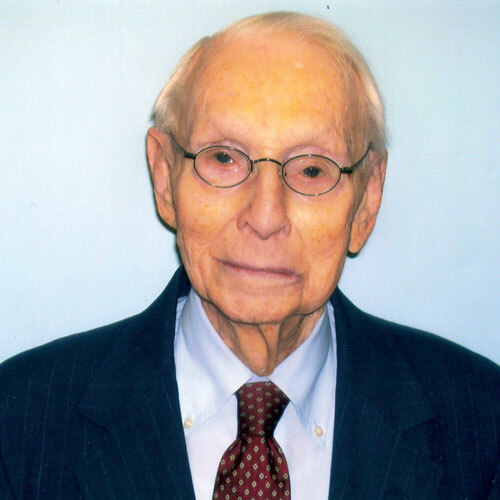 After graduation from the University, Armsey joined the U.S. Army and served in the War Department before going overseas as a public relations officer in World War II’s India-Burma theater. In 1947, Armsey went to work as director of public relations for Henry Heald, then president of the Illinois Institute of Technology in Chicago. Armsey followed Heald to New York University as assistant to the president in charge of public affairs. And then in 1956, Armsey joined Heald at the Ford Foundation. During his 21-year career at the Ford Foundation, Armsey served as director of programs in higher education, public broadcasting, journalism education and other activities. Armsey was responsible for grants of almost $500 million for education and cultural enrichment during his tenure. Armsey also developed and spearheaded a massive program of unrestricted, private university-college matching grants in 1958. These programs gave colleges and universities across the country hundreds of millions of dollars in funding. Armsey was also a moving force in the desegregation of U.S. higher education by creating a policy that refused grants to universities that segregated its undergraduate curricula. As a result, undergraduate black students were admitted for the first time at Emory, Duke, Tulane and Vanderbilt universities and a cluster of other major private colleges. Armsey also promoted journalism education through grants to start the Columbia Journalism Review, to launch an urban affairs program at Northwestern University, to initiate fellowship programs at Stanford University and to refinance the Nieman Foundation for Journalism at Harvard University. This bio was written at the time of James Armsey’s inauguration into the 2007 Illini Media Hall of Fame. Mr. Armsey died in November 2008.